I love epic brunches so much that I once created my own at home. It consisted of Thai style satay fish & chicken tacos, homemade meatballs, parmesan skillet eggs and berries and cream waffles… Plus fresh orange juice and coffee. It was nothing short of epic. But a HK$900 shopping trip at City Super, 4 hours of prep and 1.5 hours of cleaning later, I concluded that paying HK$1000 for an epic brunch out IS worth it. It’s true, I have paid HK$1000 for brunch before. But if we take a step back, there are definitely many less OTT brunch options in town and the one at Mr & Mrs Fox is the latest one I’ve tried that’s highly recommended. The biscuits/scones were not the most delicious I’ve had. But I can’t deny that it seemed like the buttery fruity bite I needed while I was starving (because it was 12:30pm and I hadn’t ingested one thing yet) and waiting for my real food. I loved the yogurt and option of trying to be healthy by ordering the mixed fruit platter as a starter. But if you’re thinking that healthy stuff is for Mondays, then they you could opt for their daily soup. There was a lot of variety in the main course section. And I was relieved to not see any of the typical cafe brunch options I could whip up myself, i.e. avocado and egg toast. The items varied from savoury to sweet, they were all a little bit unique and different, but still very brunchy. Eggs benedict is the dish I want to order every weekend out but don’t because I don’t want “to be boring” since I can “order that anywhere”. This is the perfect answer! Plus it was cooked almost perfectly. The toasted muffin still had a nice crispy exterior, even after it went through a not-too-brief photoshoot. The yolk was runny, but it could’ve been more yolkporn-oozing out-runny. It’s a good twist to the typical eggs. I’d probably get this again. 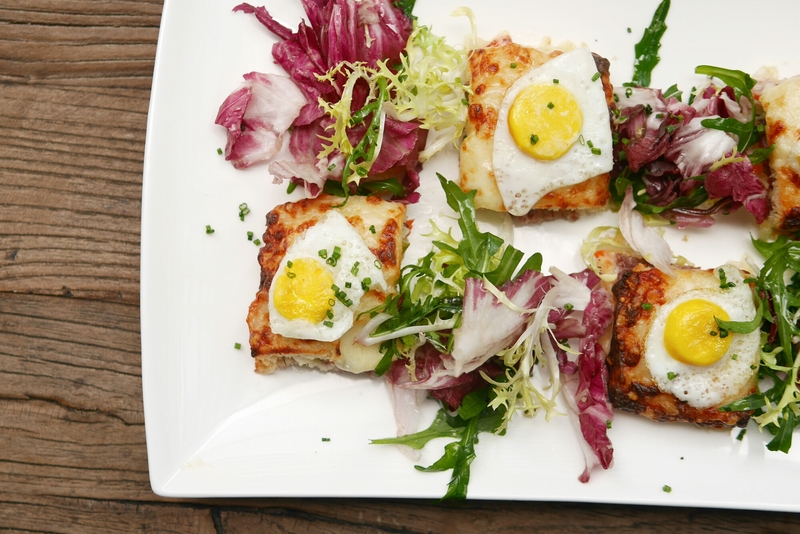 The croque madame is a good choice if you aren’t feeling the most adventurous. That by no means means it was boring though. There was a generous amount of gruyere cheese and the cheesy exterior was melted and burnt to the perfect degree. The pasta didn’t look extremely appetising in real life either. Actually from afar, we thought this was a plate of green beans. But the pasta vongole was delicious and pretty unique. The choice of pasta is already original enough – it also had a good chewy al dente bite to it. The addition of chorizo gives the overall taste an interesting spicy kick. 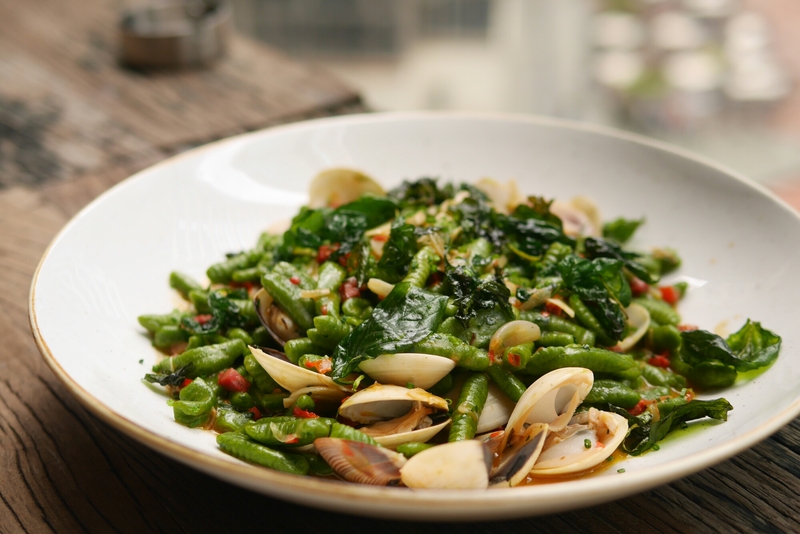 It was a pleasant deviation from the typical spaghetti vongole. 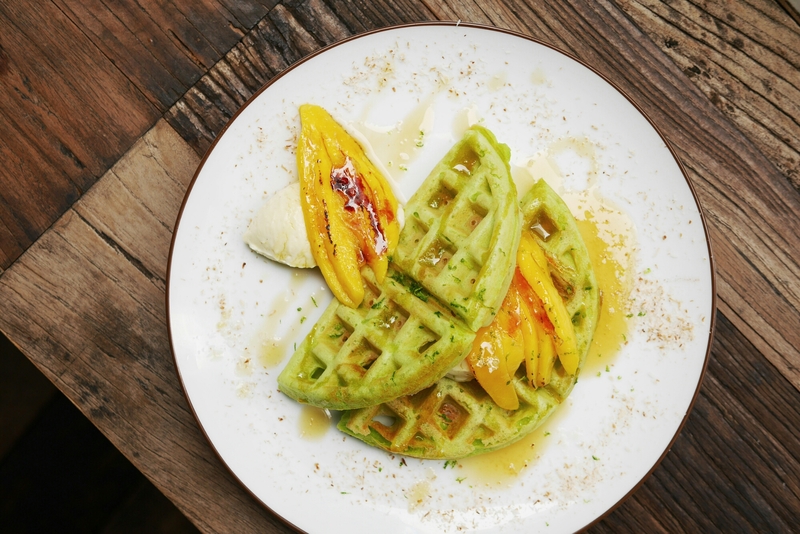 Pandan, waffles, coconut and mango all in one dish? This definitely sounded the most appealing to me. It was pretty good I’d say. But the taste of pandan could’ve been more prominent and the texture could have been more textured – I think waffles should have soft chewy insides with a crispy exterior. I still ate a lot of this but I suppose the other options stood out more. If you’re feeling for something sweet, I’d actually opt for the cornflakes crusted French toast with foie gras instead (provided you do like foie gras of course). This was another excellent and highly recommended dish with an interesting twist to it. 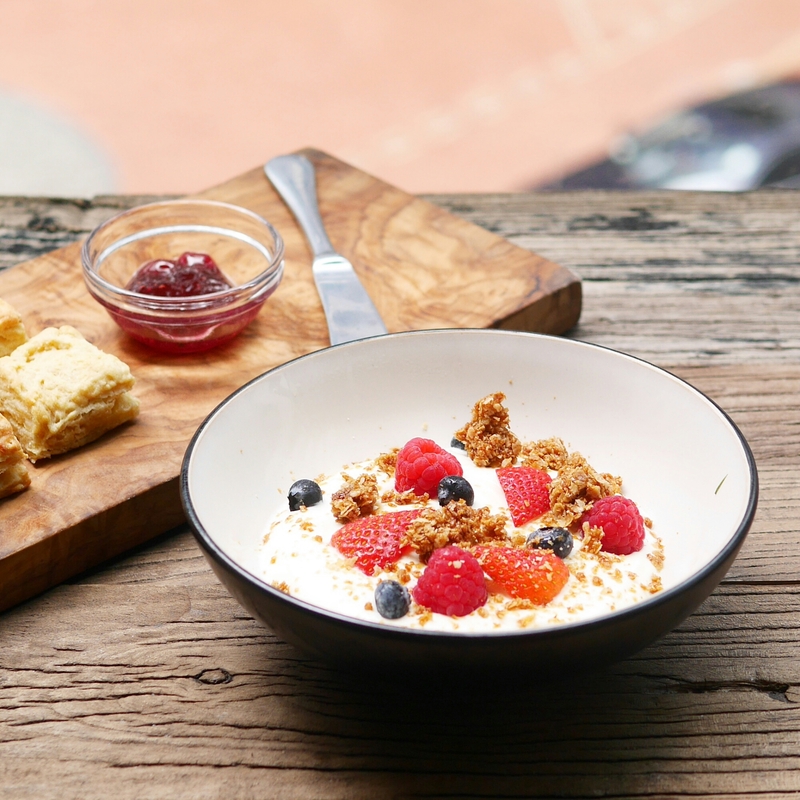 The cornflakes crust made the toast extra crunchy and sweeter too. 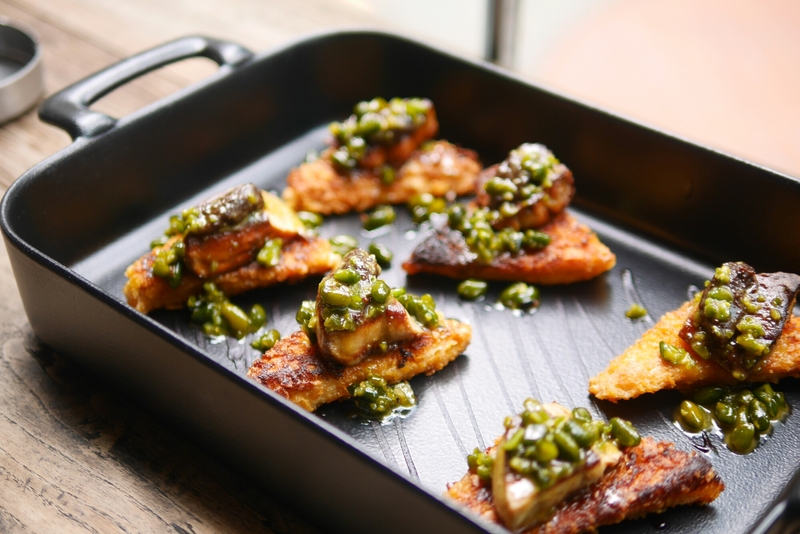 The sauce glued the two items together and the sweetness somewhat reduced the strong foie gras flavours. That was a plus for me because I’m not a huge fan of that foie gras smell. Note: Except for the pandan waffle, the mains in the photos are not the regular (but are the tasting) portions. Chrissy Tiegen’s new cookbook “Cravings” is filled with random hilarious anecdotes – I read it like bedtime stories. She puts aptly, “can we just call brunch what it really is? Booze in the morning”. No brunch is complete with some alcohol. For an extra HK$175, you can get free flow red (sangiovese), white (sauvignon blanc) and prosecco, for 2 hours. 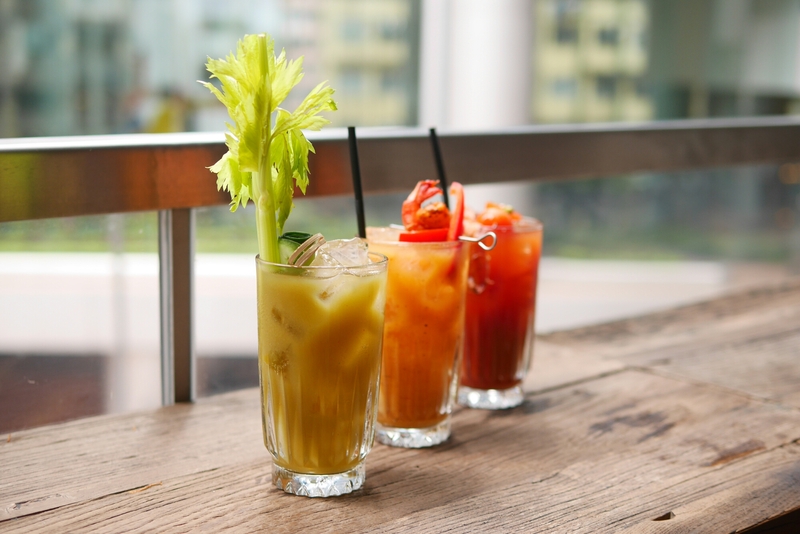 Their bloody marys are also pretty daring. They have three types made with red, yellow and green tomatoes. You can even free flow them for an extra HK$50, but since they’re all really spicy I can’t imagine anyone wanting more than one. And if it’s only one you’re having, try the yellow one, which has wasabi in it! 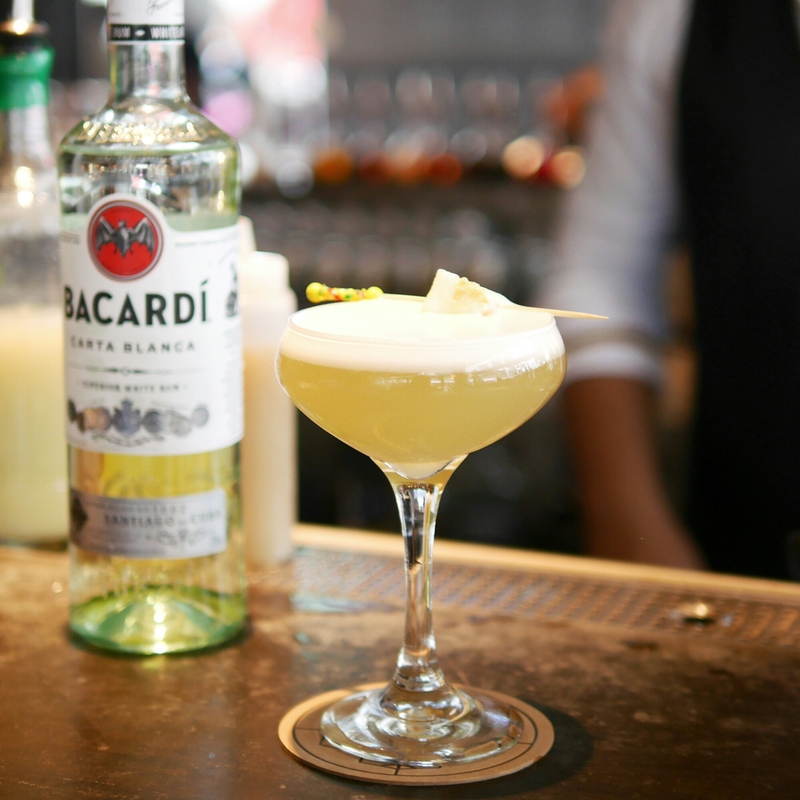 But you can’t leave without trying the winning cocktail of HK’s Bacardi Legacy: Reborn Padre Blanco. It’s strong yet also easy to ingest (perfect for girly girls) and is quite refreshing too. The dessert is not included in the meal and I’d imagine many would feel decently full after the set to warrant not ordering extra food. But if you’ve got unlimited stomach space for desserts like me, you HAVE TO order this. The centre is moist and airy, quite eggy too. It goes very well with the buttermilk on the side. 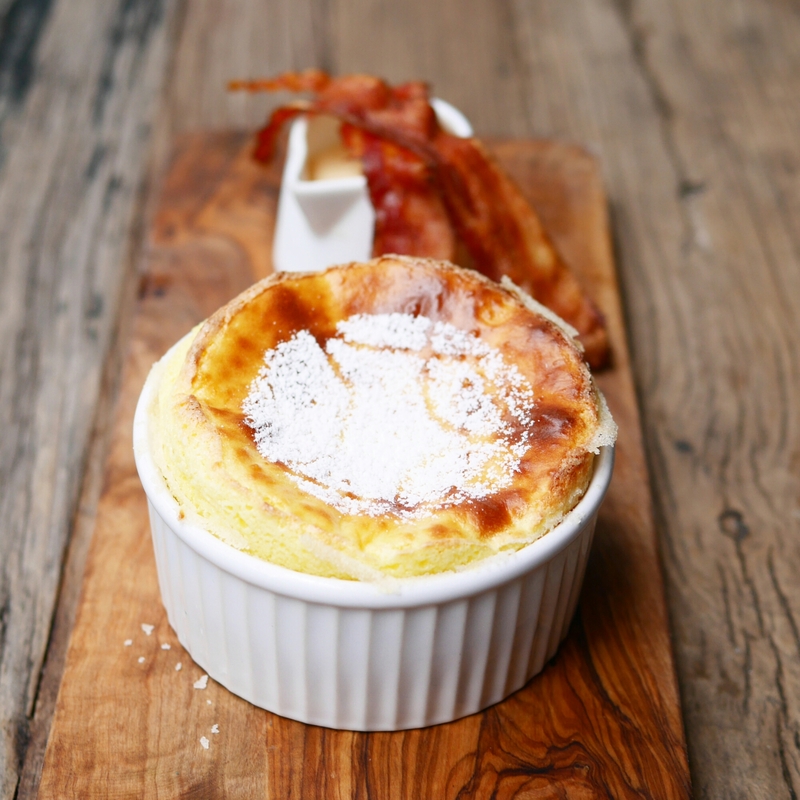 It also comes with bacon but I think that’s just for aesthetic purposes… It didn’t really click with the souffle. I’ve always loved the ambience at Mr & Mrs Fox; it’s even better in the day time with the natural lighting. But I honestly haven’t been a huge fan of their food at dinner times. The menu choices are not vast. They focus on steaks but I think the quality is just not up to the top steakhouse standards in Hong Kong. 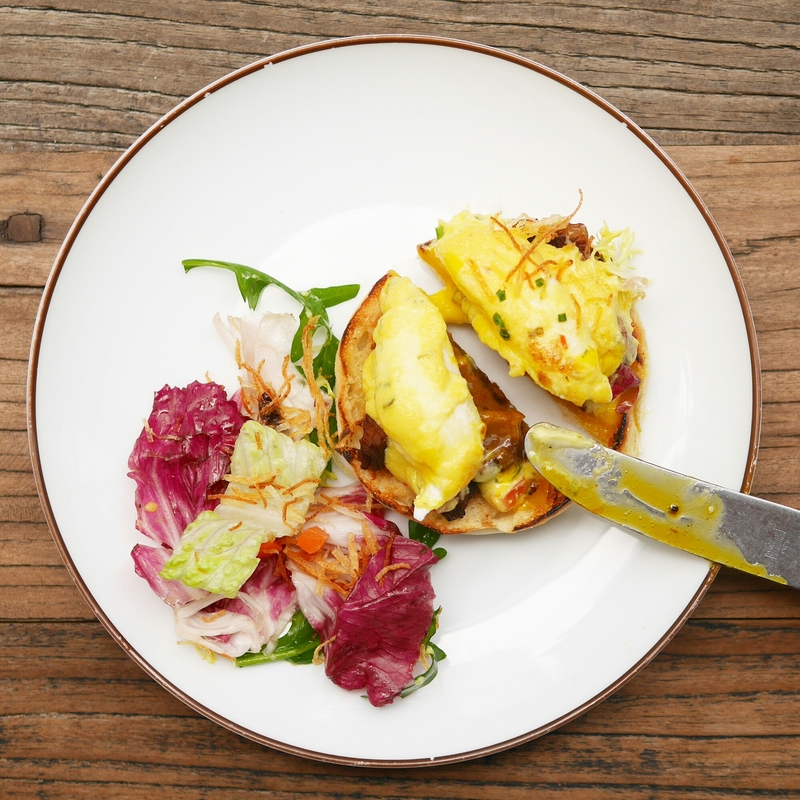 On the other hand, their brunch stands out with creativity, execution and value. It’s not as filling as a brunch buffet of course, but I think we can agree that’s a good thing. On my next visit, I foresee my main struggle to be between ordering the short rib eggs benedict or the foie gras french toast. No question I’d order the souffle, no matter how full I am. But I’d also secretly hope someone would get their pasta vongole so I can have a few bites!